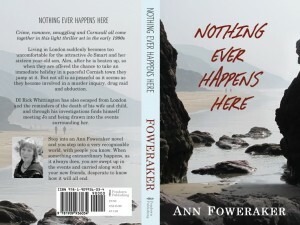 …… to Eleanor Beavan as the winner of the signed ‘blog-launch’ copy of the new paperback of Nothing Ever Happens Here! Belly dance post – What on earth should I wear? 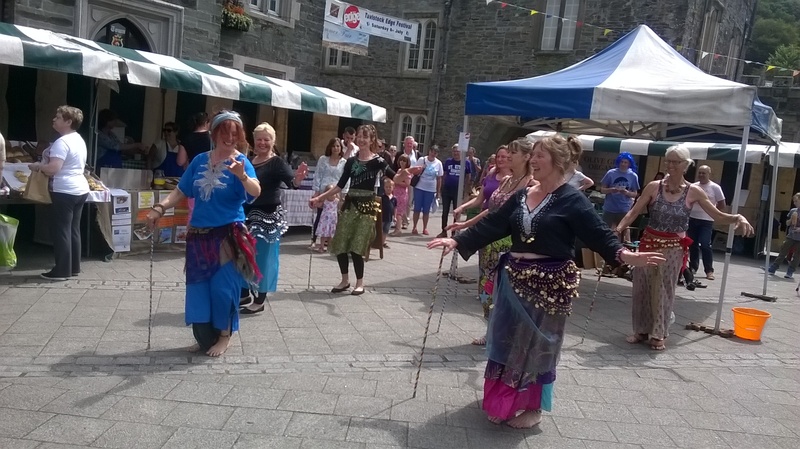 … it has been a while … and posts do get well and truly buried … so when I was reminded of an very much earlier post this weekend (while talking to someone about joining our belly dance class and what she could wear) – I decided to reprise this post. 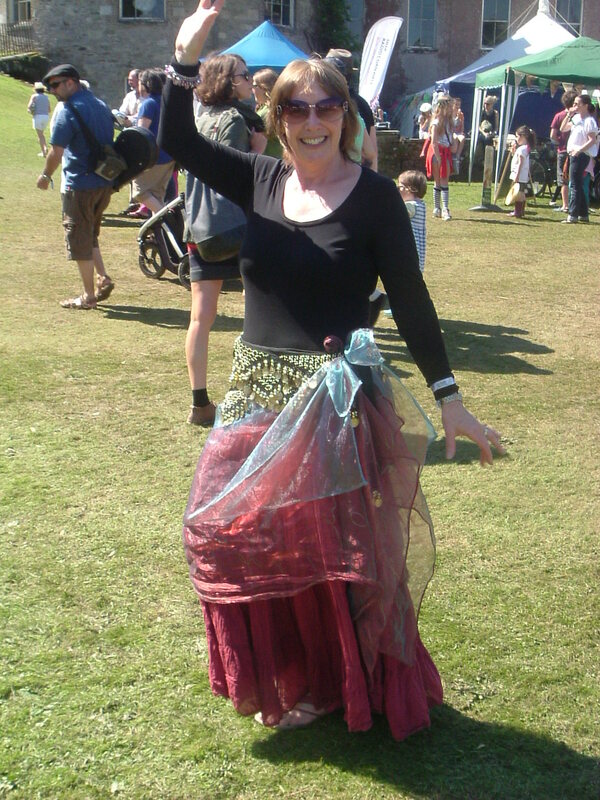 I have been belly-dancing for about fourteen years now – still LOVING it – never bored with it (unlike exercise classes) yet it offers superb CORE MUSCLE exercise and muscle and joint flexibility with little impact stress. Think of it like going to a fancy dress party, on a weekly basis, permission to dress up outlandishly in bright swishing colours and fabrics with rings, anklets, bracelets, and bells, and jingly coins – such fun, and that’s before the dancing. Oh, and if you think that this is normal for me, I need to explain that my usual wardrobe consists of, black (black and black) burgundy, cream and a little summer turquoise, jewellery: one wedding ring, one watch. I know some dance groups are more focused on a ‘look’ than ours, but the eclectic look we have suits us well All sorts of colours and a lots of ‘bling’ and everything from purpose made kit to the opportunistic find at a charity shop or a bric-a-brac stall at the village fair. And it’s ‘Oooo that’s lovely, where did you find it? Or. ‘You been hitting ebay again?’ Or ‘How did you make that?’ when new items turn up in our friends attire. For me, note – not for everyone, but for me the real essential is a coin belt, and for me, again, the jingle-jangly the better. I have amassed a fair number over the years, and my lovely daughter-in-law brought me a stunning range of new coin belts as a gift the last time they came over. 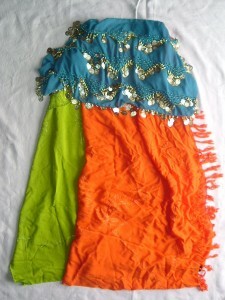 Look for a belt that has plenty of overlapping coins on mesh-fabric or tassels that can move easily. 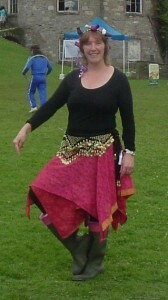 Without the coin belt I am never sure of my shimmy, with it I know exactly how it is going! These I usually wear over swishing long skirts or similar, with other layers of gauzy, sparkly or shiny materials tied around the hips. An interesting way to get a good look is to tie two sarongs (we all have those around don’t we?) 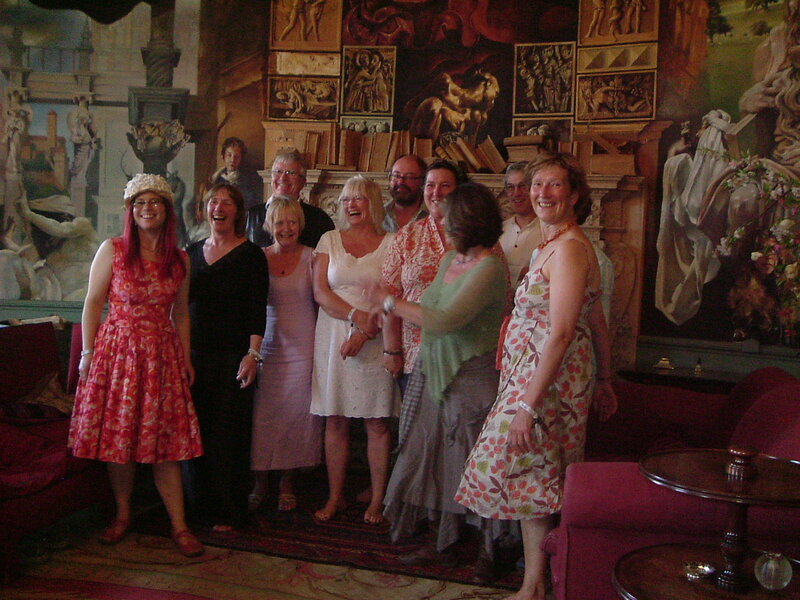 one over the other in opposite directions, knotted on the hip (emphasising the hips is good!). Thus, movement on one sarong flashes the colour of the other and gives plenty of room for leg movement. Over this tie a gauzy layer, or just top with a coin-belt in contrasting colour. Handkerchief style skirts, double layers with lots of points and in pretty fabrics can work well over black leggings, again topped with a contrasting belt. My favourite, a two-tier silk skirt bought in a French street market, with contrasting coin belt, often with gauzy layer over too. I tend to wear simple black tee-shirts with ¾ sleeves and add bracelets and anklets for any further decoration. 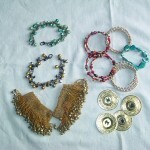 Others have finds of sparkly shrugs, tops, and tee-shirts, ear-rings, necklaces and hair-clips. So, there you have my guide to what to you can wear… easy to put together stuff or specialist. 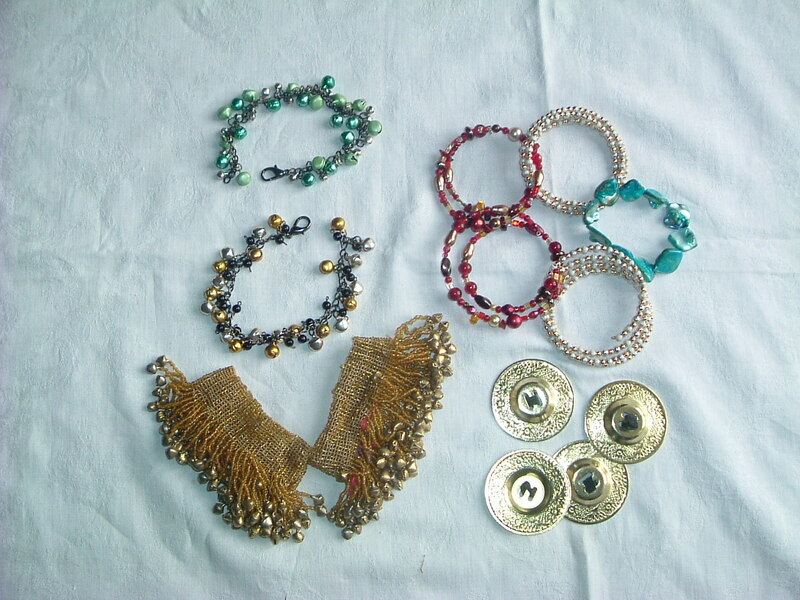 If you are attending your first belly dance evening your teacher will probably have coin belts or even swishy scarves you can borrow, or other members of the group – their bags stuffed with their extras – may offer to lend you the basics for the evening. 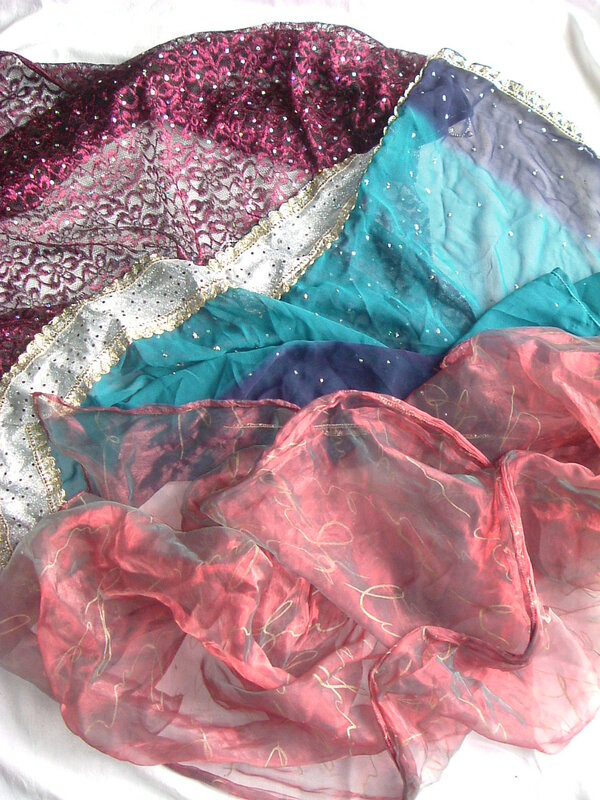 Beware, collecting interesting belly dance clothes and bits and pieces can get addictive! 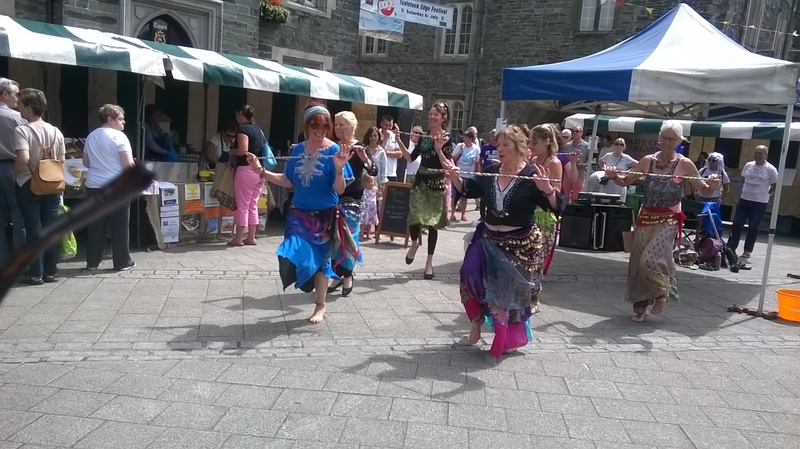 Are you a belly dancer? If so – what are your essentials? If not – are you tempted to find a class and have a go? 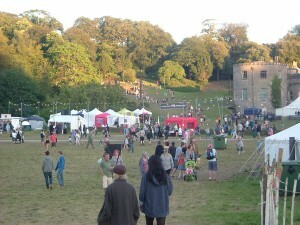 What do I love about the Port Eliot Festival? Well, since you ask – feeling like I am in another world. 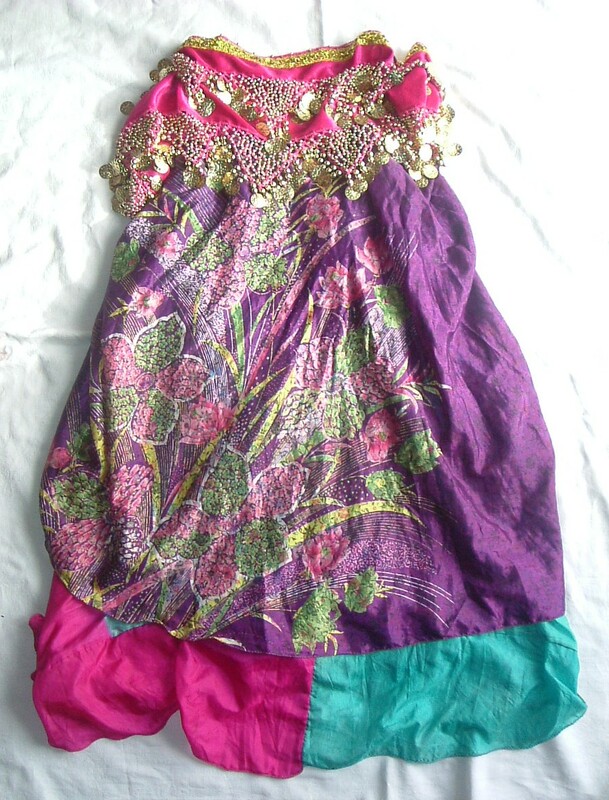 One where wearing floaty and shimmery fabrics and jingly bright coin belts with bells at your ankles to ring at every step is – normal. Or wearing a bunch of flowers attached to a head band, or a huge paper fan taped to your waist, or a gold lamé dress with wellington boots and a cowboy hat is – normal. (Actually, wellies were only needed the first day and then only on some paths, didn’t stop some people wearing them all weekend though – must be from the city, us country folk get fed up having to wear them feeding the animals and such as it is) Where you can go from a serious talk on the life of Edward Thomas (the poet who wrote Adlestrop) by Matthew Holis author of Now All Roads Lead to France to a mad and manic music performance by Mik Artistik’s ego trip — in the space of three hundred yards and ten minutes and all against the wonderful back-drop of the Port Eliot Estate. Here’s a view from near the Round Room tower, looking towards the entrance to the festival. Not sure about other festivals – but this one is about as mixed as I can imagine. You may have guessed by now (if you’ve flicked through my past posts and topics) that I am interested in all sorts of things and this place offers all sorts to interest. 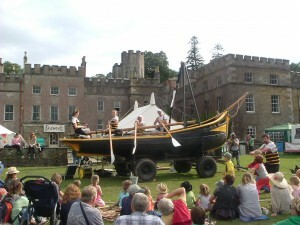 Let’s start with the fact that the festival is in Cornwall and this year there was a group of performers informing all and sundry of the history of Cornwall – through the greatest men and women of Cornwall, by performing various tableaux and singing along, with a rousing chorus of ‘Shall Trelawney live or shall Trelawney die? as a finalé . 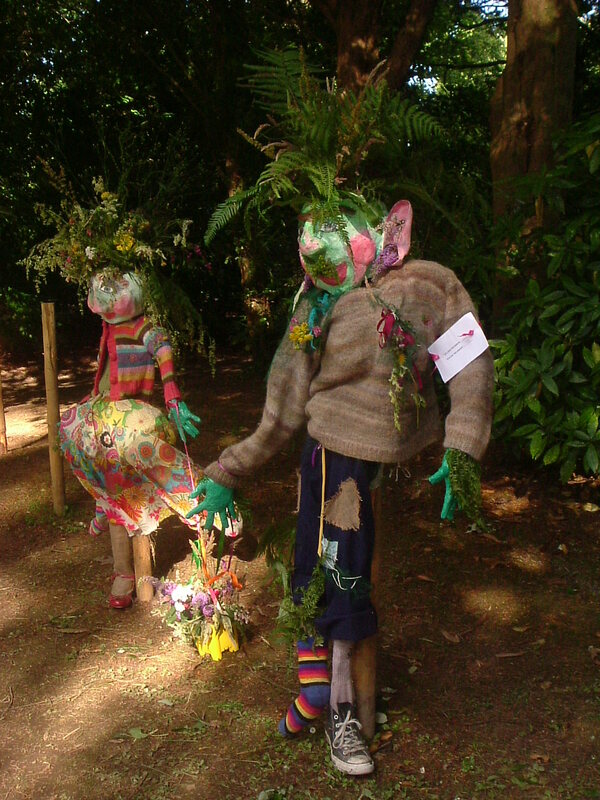 Add in a small folk band called The Butter Thieves turning up on the green infront of the house to sing Cornish folk songs like Lamorna – soon joined by locals who knew the words. And, from ‘over the water’ (Devon) Vocal Harem – a huge choir of mainly women who sang at the Bowling Green venue on Saturday afternoon. Amongst my favourites (again) this year was Luke Wright – a performance poet , a balladeer for today. Poems fast, furious, sometimes comic, sometimes tragic, pour unaided by notes from this young man and newly inventive every year. 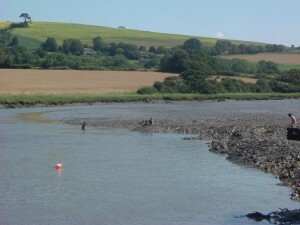 A beautiful stroll through wooded areas brings you past The Idlers Academy and to the river – where I came across rather late wild swimmers (the majority of whom had swum whilst the tide was in) these appeared to be enjoying slip-sliding down the mud banks into the water! On my way back, over the hill this time, I came across a secluded tea room with sunny slopes and up behind them a lively choir singing an impromptu set. Back down to the green before the castle and more stalls – as are dotted all around the site – selling wonderful selections of foods, crafts and the weird and wonderful – from garish clothes to wild hats – with flower hair-garlands galore this year. 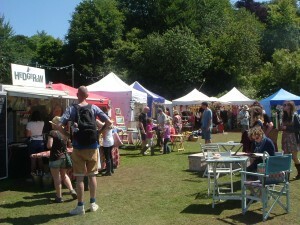 Mine (seen wearing in the ‘wellie’ photo) made by my friend Christine from CornishCreams – handmade organic skin care products who was at the festival selling her creams but also making garlands with wooden roses! 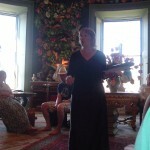 She also kindly took these photos from the poetry reading of the Liskeard Poets – unfortunately the performance area was right in front of the windows, but I am there mid-speech and in the group photo which is included so you can admire me some of the wonderful painting, which covers the wall of the Round Room, by Robert Lenkiewicz. Click on the photo to get a better look. 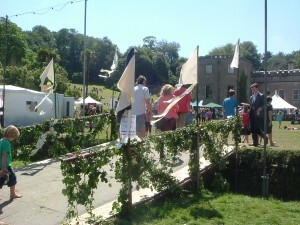 And so home – across the decorated temporary bridge over the haha – leaving around nine – still long before the end of the festival which had been running from Thursday lunch time and finished after midnight on Sunday – the golden light illuminating the trees as I left Port Eliot. Sad that next year they are taking a rest and so we have to wait until 2014 to escape into another world as easily again. 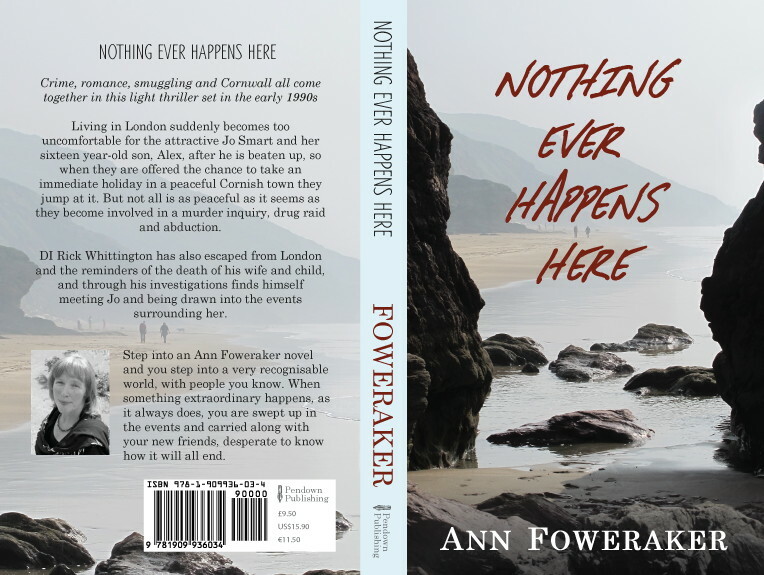 Don’t forget – if you entered my Win a Kindle draw (drawn on 10th July 2012 – results here) you are welcome to claim your consolation prize of an ecopy of ‘Leave to Appeal – a novella’ – details of how to claim HERE As a novella this is short enough to read easily on your computer if you do not have an ereader – just opt for the book in pdf. I look forward to hearing from you! Do you go to festivals? Do you have a favourite – what makes a good festival for you? I’d love to hear from you! 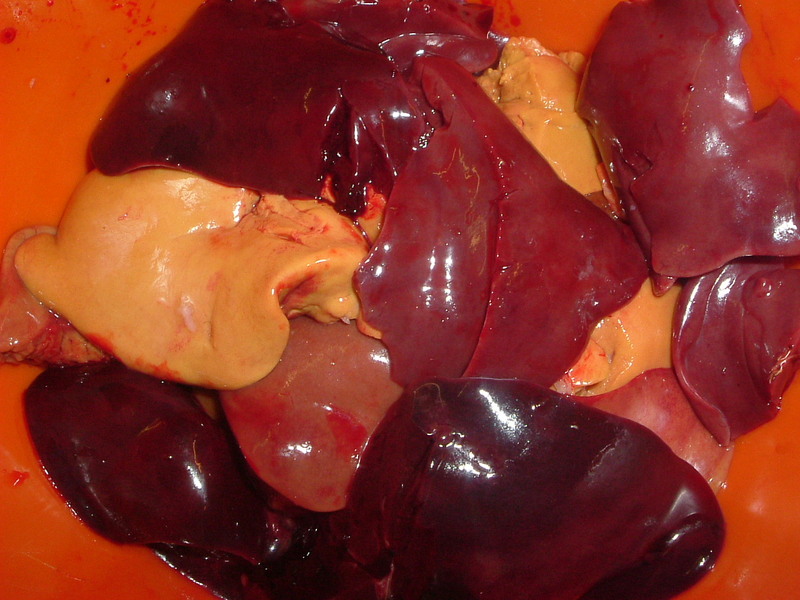 However, I am still going to post this photo as I find it so interesting to see the wide variety in livers when all these birds were raised together, free-ranging with poultry corn ad-lib. Needless to say this is the sort of job that is not done in five minutes and comes on top of the usual slate work and general household chores. 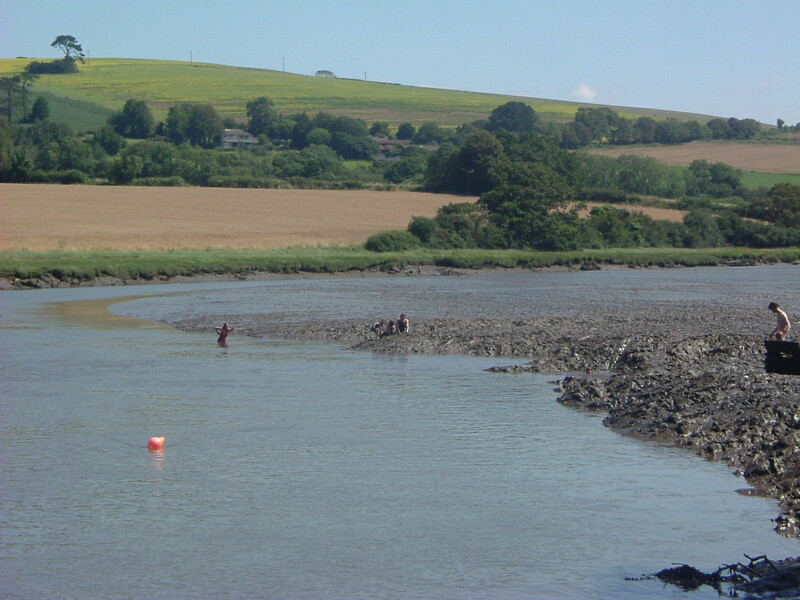 Then there was the fact that I had set myself a deadline for completing the first major edit of my new novel ‘The Angel Bug’ as I had promised to send it to Tim Smit of the Eden Project, Cornwall to read and to get his ok for me to use him as a character (as the only real person in the whole novel) So all the time I could access to sit before the computer was devoted to that. Anyway I got to thinking what I would call ‘growing old disgracefully’… or perhaps not disgracefully but certainly not growing old as expected. 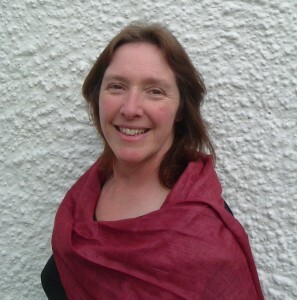 Along with many others I love the list of ‘disgraceful’ things Jenny Joseph says she will do in her poem Warning – ‘When I am old I shall wear Purple, With a red hat which doesn’t go, and doesn’t suit me.’ If you don’t know this poem it is worth looking up, however, some of the things she warns that she might do seem old-fashioned for today. 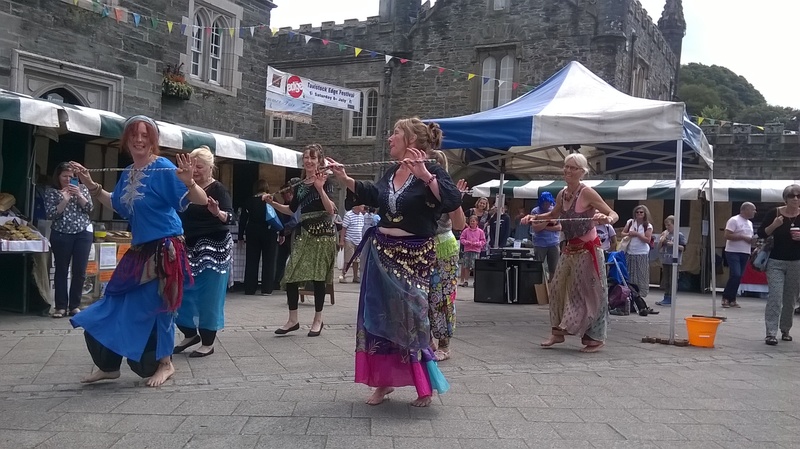 A good friend of mine went to her first belly dance lesson at the age of sixty … as I already do that I started wondering what I can take up when I get to that age. One of the most enjoyable afternoons I had recently was when sons 2 and 4 took me rock climbing. 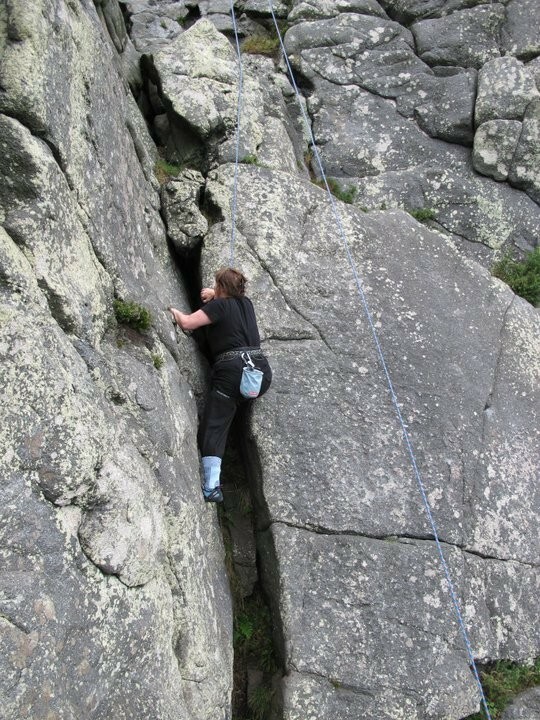 This is only the second time I have done this (first time in my forties with the WI!) but I got a real buzz from it. This train of thought led onto the ‘bucket list’ that has become popular, a wish list of things to do or see before you die (or reach a certain age). So I’ve started compiling mine, not necessarily ‘disgraceful’ things, more adventurous, exciting or unusual things to try, see, experience. What would be on your list? 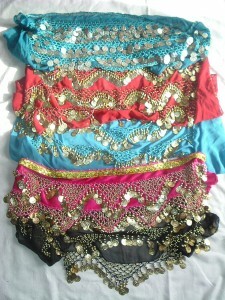 Belly Dance? What on earth should I wear? I know some dance groups are more focussed on a ‘look’ than ours, but the eclectic look we have suits us well All sorts of colours and a lots of ‘bling’ and everything from purpose made kit to the opportunistic find at a charity shop or a bric-a-brac stall at the village fair. And it’s ‘Oooo that’s lovely, where did you find it? Or. ‘You been hitting ebay again?’ Or ‘How did you make that?’ when new items turn up in our friends attire. 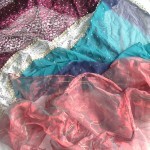 Are you a belly dancer – what are your essentials? Ok, so I love belly dancing! 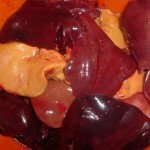 It always leaves me feeling so good. Your whole body gets a really good workout without you even realising, as you are just having fun. 2, Belly Dancing is not just shaking it all about. 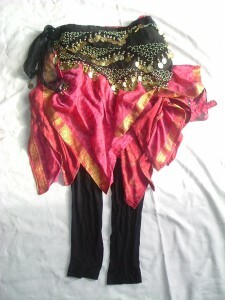 Belly dance is about control, about isolation. Isolation is where you focus on moving one part of the body but keeping the rest still, to circle hips and keep your whole top half still is no mean feat, but try circling your top half and keeping your hips still – so still that the coins on your coin belt don’t even shiver, that’s hard! To shimmy your hips and keep shoulders still, to circle one hip and keep the other leg still, the arms and upper body still… it all takes practice…but it is fun and strengthens core muscles in a weight bearing low impact exercise – so is good for you too. So, every Thursday in term time you’ll find me, and a lovely group of women, all ages from teens to sixties being guided through our paces by the beautiful and graceful Jules in Gunnislake, where we take over the primary school hall for the evening, dressed in our finery with barely a belly on view (what to wear is a whole other blog) and having fun getting fit and flexible. I took a snap-shot of Jules for this blog .. but as I didn’t have the camera set to ‘sport’ it came out blurred… so I may add one later. 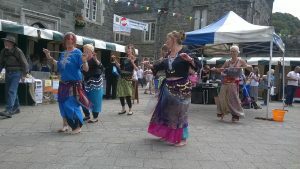 Obviously I am just a participant and an amateur at belly dancing, though I calculate that I have been learning it for ten years or so, what aspects would people like to know more about? Speak now or I shall just blog on in my own sweet way. 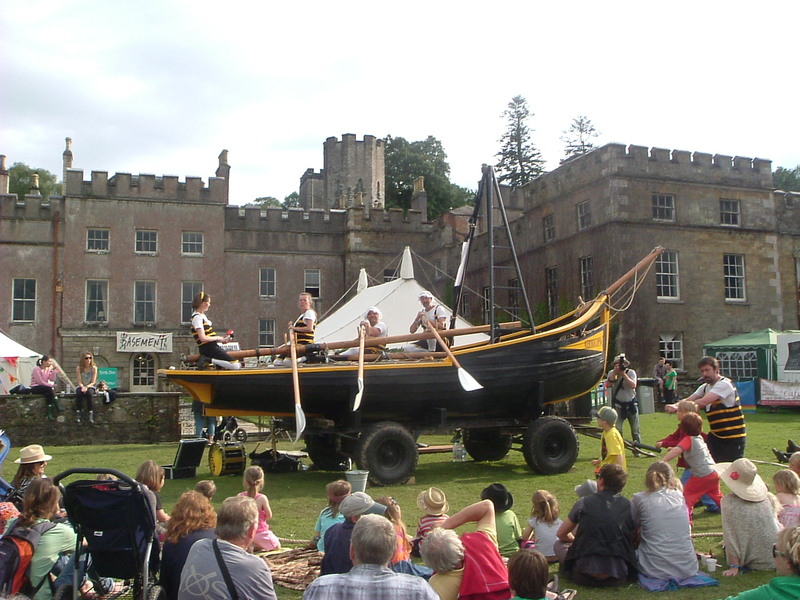 More Port Eliot Festival …..
Wow! 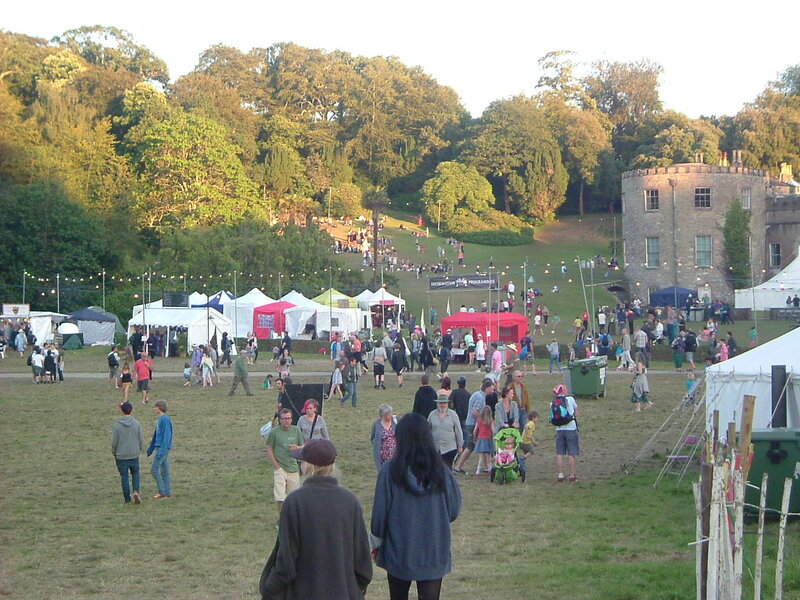 What a great festival… the weather gave showers for the Friday but they soon cleared, and I ended up leaving my wellies in the car and favouring sandals all day. 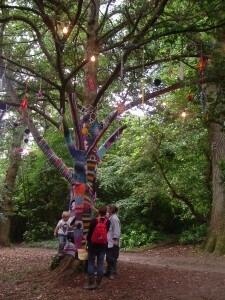 So, if you’ve never been to Port Eliot Festival you have to know that most recently it was a Literary Festival with a wild past (known as Elephant Fayre in the 80s) that has now matured into a brilliant all round, family friendly festival, something for everyone, everyone pretty laid back and in such beautiful surroundings. 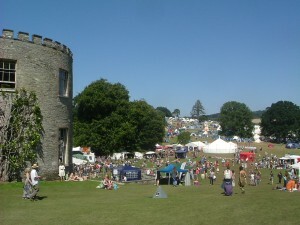 There is plenty of the literary festival still there with readings, discussions, interviews etc but is combined with music, to suit many tastes, wild swimming, cinema both in the house and at night down by the river, fashion, flower arranging, poetry, food from small Cornish frozen yoghurt business to Jamie Oliver’s Fifteen, cookery demonstrations, bars, comedy, cabaret, stalls, a whole area just for children to enter into a fantasy land of making playing play acting, dressing up and doing wonderful stuff, wandering musicians, jugglers and dancers. Dovegreyreader (blog-site) even had a tent where you could sit while she did interviews and you could knit, should you wish to. 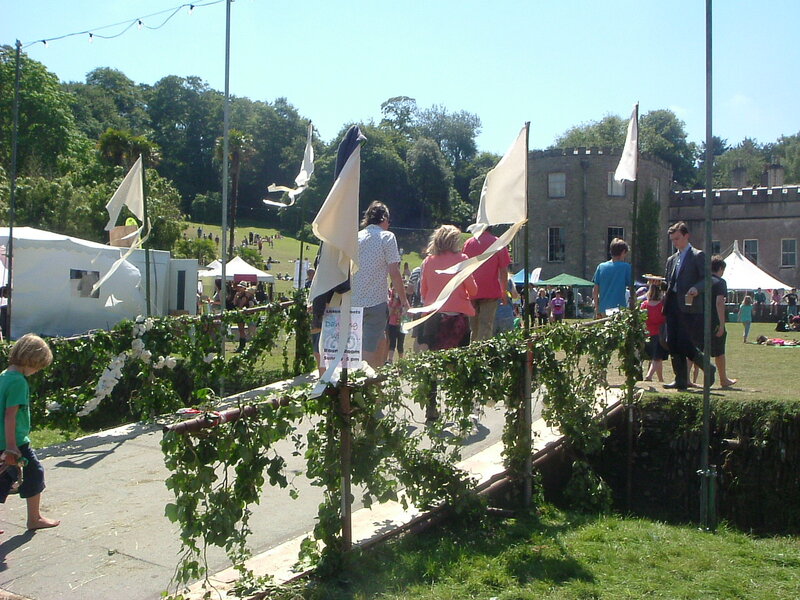 What did I notice… well people always dress a little differently when at Port Eliot (especially if they’ve visited the Fashion tent) and the stalls selling weird and wonderful hats, (vintage and modern) and the same in clothes attract a lot of people who obviously arrived and only then realised people treat the place like a big fancy dress event. Me? 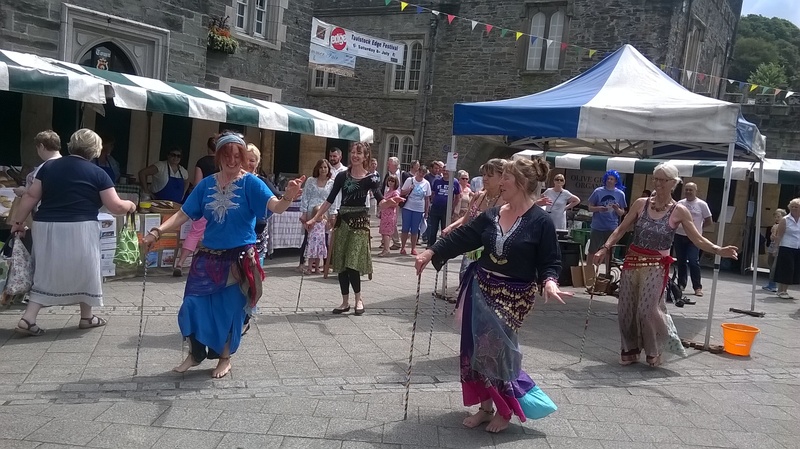 Well I went wearing one of my belly dance coin belts, over layered skirt and wrap and jingled my way about…. 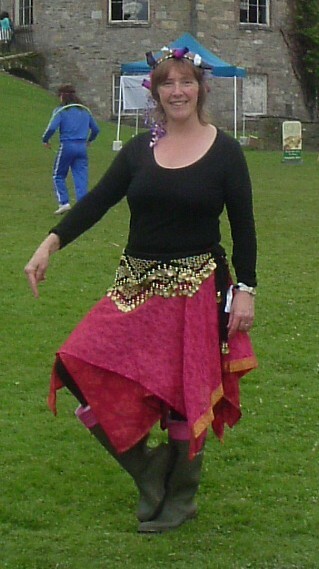 part of my reading included words describing a belly dance and so it was also a prop! Secondly… as I said the weather really didn’t need wellies…yet all through so many people were wearing their wellies (all sorts – multi-coloured to standard green or black)… even on the stage, as did Kate Winslet when she read to the children from Mr Gum … perhaps they didn’t bring any other footwear … it being a festival and all. 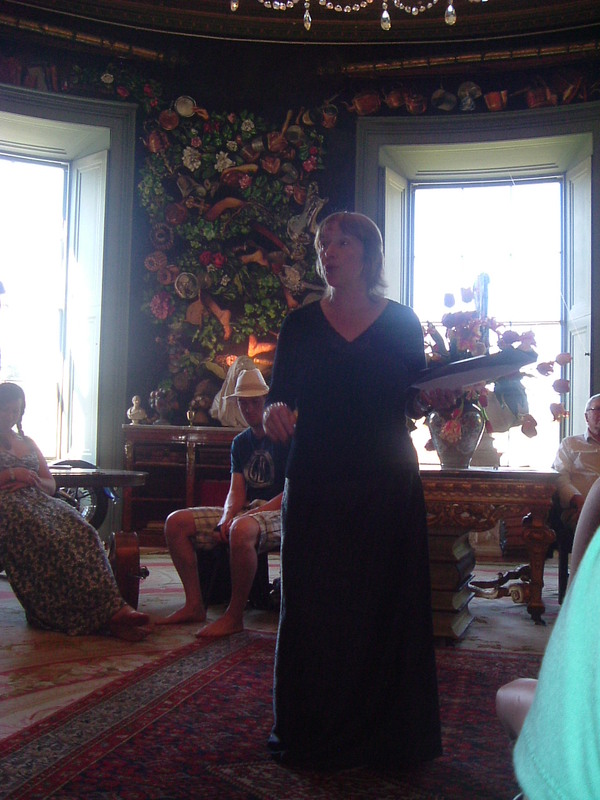 Our reading in the round room went well with nearly a capacity audience – everyone in bare or stockinged feet in there as have to take your boots off at the door …. can’t wait for next year! I decided it was about time I started a blog… after all I’ve been writing one in my head for ages.